Another US recession? 30% chance, says Greenspan! The chances of the United States economy slipping into another recession are close to 25-30 per cent, a noted American economist said. "I see a third to fourth of a chance of a double-dip (in the US economy)," noted American economist and former chairman of the Federal Reserve of the United States, Alan Greenspan, said while addressing an audience through video-conferencing during an award function in Mumbai on Wednesday. The chances that the US might slip into another recession are 25-30 per cent, Greenspan said. According to him, to reduce the double-dip recession probability, recovery in asset base should be created through rising asset prices. Image: Alan Greenspan, former chairman of the Federal Reserve of the United States. The US Central Bank has done an excellent job to tackle the finance crisis, he said. "You have to sovereign credit for private credit in the wake of the crisis," Greenspan said. While expressing concern over the long-term impact of government deficits, Greenspan said that this had been a crisis of unprecedented proportions, but he did not see another round of stimulus in the US. 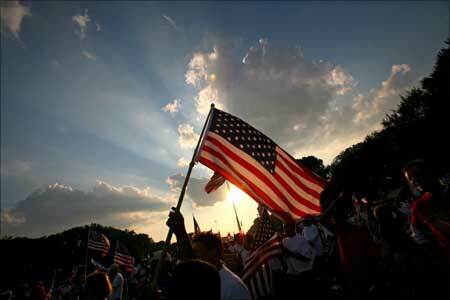 "We have had enough stimulus in the US for the moment. It is not a good idea to expand deficit levels in the US. Longer-term consequences of expanding deficits are 'extraordinarily negative.' 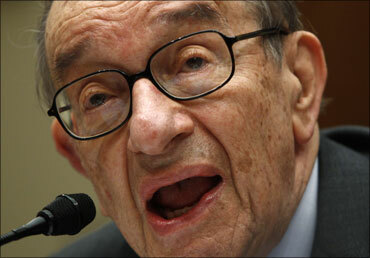 We need to allow the markets to absorb stimulus and calm down," Greenspan said. The major problem right now is an extraordinary amount of risk aversion, he said. According to Greenspan, the idea that economies can decouple is an illusion as emerging economies are closely connected with the developed world. "Emerging economies cannot hope to decouple from the developed world. 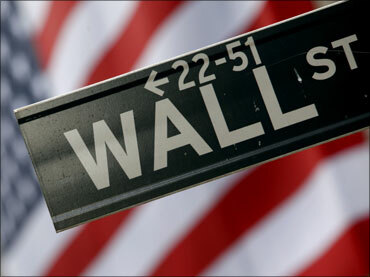 The recovery of consumer demand in the US will be a critical part of sustaining growth in emerging economies," he said. While referring about stock markets, he said that the influence of stock markets on economic activity is underestimated. "Stock markets should be seen as a leading indicator to the economy. The rebound in stock markets and other asset markets could help revive sentiments. 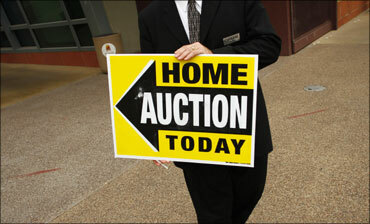 Stock prices will be a lead indicator for a turn in any economy," he said. Indian economy is looking like one of the strongest economies from a structural viewpoint, he said, adding "India is doing better than anybody in part because it is largely self-contained." Image: US could be hit by yet another recession.